"Merci"... translates as "Thank you". It's probably one of the nicest phrases there is and who doesn't want to be thanked for something? 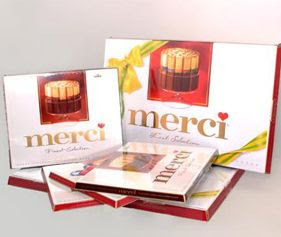 With a name that translates as "thank you," Merci chocolates gives us something to be grateful for. These chocolates are rich, creamy and satisfying with a variety of flavors to indulge in. I recently reviewed these chocolates and they certainly make for a sweet gift not only during the upcoming holidays but also to give year round. There is no better way of expressing heartfelt gratitude than with a gift that speaks for itself: Merci Finest Assortment of European Chocolates. The delicious selection of rich European chocolates made from the finest ingredients available, provide indulgence and variety. With flavors like Cream Truffle, Hazelnut Almond, Praline Creme and Dark Cream, Merci will delight the palate. The idea for Merci was born in 1963, when it began to win over people's hearts as the first individually wrapped gift-giving chocolate in Germany. Nowadays, people in over 70 countries of the world - from Poland to Singapore, from Sweden to Slovenia - give Merci chocolates as a gift. Our favorite was the Hazelnut Almond, followed by the Praline Creme. It was hard to decide our favorite simply because they were all so good! The packaging was also great, with each chocolate bar individually wrapped. Being small enough to tuck away for a special treat later, these two bite chocolate bars often hit the spot when I needed to satisfy a sweet tooth. With the holidays quickly approaching and even with Valentines' Day not too far off, look for Merci Chocolates at a store near you.